What is Ip Man Wing Chun? Wing Chun is a very unique and scientific form of martial arts. Wing Chun is a style of Kung Fu that originates from China, the martial art was later refined in Hong Kong by the late Ip Man. Wing Chun's specialty is in close contact combat, using quick punches and kicks with a tight defence, coordinated through agile stances and footwork for a quick advance. The effectiveness of this fighting style is achieved by well coordinated attacks with simultaneous defence and vise versa. Due to its effectiveness this martial art makes for an effective form of self defence. The student must learn to deliver the correct amount of energy or force, whilst staying relaxed when possible. A good Sifu (instructor / teacher) will teach the student to overcome force and strength with positioning and turning rather than meeting it head on. The style uses kicks, sweeps, elbows, palm strikes, punches, trapping and control techniques as part of its fighting arsenal. Pictured top left is Grandmaster Ip Man (sometimes referred to as Yip Man). 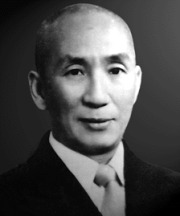 Ip Man taught many famous martial artists including the late Bruce Lee. The other photos are Ip Man's sons Grandmasters Ip Chun and Ip Ching, and their student, Samuel Kwok. This linage can trace its history back to the origin of Wing Chun. It was Ip Man's dream to make the Chinese martial art Wing Chun, a well respected fighting system around the world, and through tuition by his sons, Samuel Kwok has played his part over the last twenty five years. Sam Kwok has helped bring Wing Chun to the forefront of Martial arts practice today. 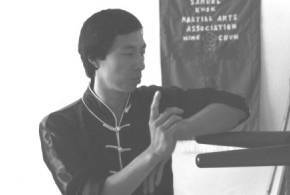 Grandmaster Kwok has wrote a couple of great Wing Chun Books and made many Wing Chun Videos and DVDs which help students across the world improve their Wing Chun. There are many martial arts schools and instructors up and down the United Kingdom, as well as across Europe, in Denmark, Germany, South Africa, Australia and the United States to name a few. Many of the Sifu's at these schools owe a great deal of their understanding of the art to the influence of Samuel Kwok's teaching of traditional Ip Man style Wing Chun Kung Fu.. The martial art Wing Chun is sometimes referred to as Ving Tsun, Wing Chun Kung Fu (or Gong Fu), Wing Chung, Wing Chun Boxing, or even Wing Chun Kuen (fighting) amongst some other names. More recently research shows people write Wing Chun Gung Fu and Wing Tsun. The reason for these differences is because Chinese text does not translate precisely into Western letters or even western speech. However the name is not the important thing. The most important thing is that the student learns an effective form self defence and fighting. The martial art is a style of Kung Fu. Kung Fu roughly means time and effort and originally referred to any skill painstakingly developed. Recently Kung Fu has become synonymous with martial arts. The Chinese characters are for Wing Chun are 詠春. Samuel Kwok, under the guidance of Ip Chun and Ip Ching, continues to represent Traditional Ip Man Wing Chun in Europe, as he has done for many years. Use the links at the top of the page to navigate the site, and learn more about the traditional Ip Man style. 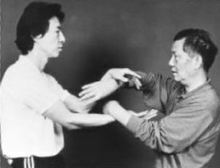 The Site contains many videos and photos of Wing Chun in action. In the true spirit of Wing Chun and with the aim keeping the art practical and efficient, Samuel Kwok has trained with many different martial arts masters over the years. This includes masters from Brazilian Ju Jitsu (BJJ), Mauy Thai, Kickboxing and professional boxers. 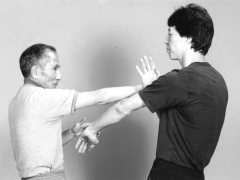 This has ensured that Samuel Kwok's teaching of Wing Chun techniques is of the highest quality and always practical. Cleaned up footage of the late grandmaster Ip Man. This was filmed in 1972 just 2 weeks before Ip Man passed away from cancer.